For students in the Disarming Conflict: Weapons of War and the Quest for Peace course (GS435) at Wilfrid Laurier University, getting outside of the classroom brought course knowledge to life – an immersive experience that paired academia with the reality of peace and conflict resolution. A group of 25 students in the fourth-year seminar attended the International Humanitarian Law Conference on Nov. 13, gaining knowledge about how to make a difference. “The conference provided students with a great opportunity to see their potential in the global context of international law and disarmament,” says Edmund Pries, assistant professor in Laurier’s Global Studies and Religion and Culture departments. The Canadian Red Cross hosted the conference for its second year at the Balsillie School of International Affairs (BSIA), in partnership with the BSIA, Laurier’s Department of Global Studies and Faculty of Education, Conrad Grebel University College, Project Ploughshares and Global Affairs Canada. 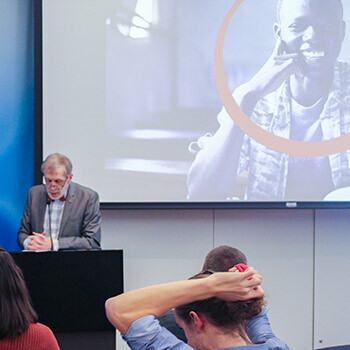 Students, scholars, humanitarian practitioners and representatives from the Canadian Red Cross came together to explore how international humanitarian law can be used as an instrument of peace. Students gained a deeper understanding of the complex issue of global peace and conflict – specifically disarmament – through discussions about disarmament and arms control, the importance of education in conflict and peace times, and health and disability in armed conflict. “We’ve been discussing global weapons disarmament in class, so it was good to experience a conference like this addressing and educating us about this issue,” says Wafaa Jawed, a part-time student in the Global Studies program. Pries teaches two upper-year seminar courses in the Global Studies program for the Peace and Conflict stream: GS434, Armed Conflict and International Humanitarian Law and GS435, Disarming Conflict: Weapons of War and the Quest for Peace. Pries has taken each class to the International Humanitarian Law Conference so students can connect in-class content to real-world teachings. Students are required to prepare for the conference, attend and participate, as well as complete a written assignment in the week following. The Canadian Red Cross and the BSIA covered students’ costs for the conference. Jawed currently works part time in fundraising for a local non-profit organization. She has hopes to continue her career in fundraising, while using education as a tool to influence communities about peace and conflict, perhaps in a volunteer capacity. Lawler, who’s very interested in disarmament, hopes to pursue a master’s degree in international relations after Laurier and eventually work in global affairs. “Before the conference, we approached the issue of disarmament from a very academic perspective. But networking and talking to professionals from various NGOs and backgrounds, including teachers and PhD candidates, helped us seek a practical way of doing things and apply it back to our work in academia,” says Lawler.